We invite parents, family and friends to recognise the achievements of the CCF by joining our Annual Mess Dinner at 6.00pm for 6.30pm that evening in the Main School Hall. 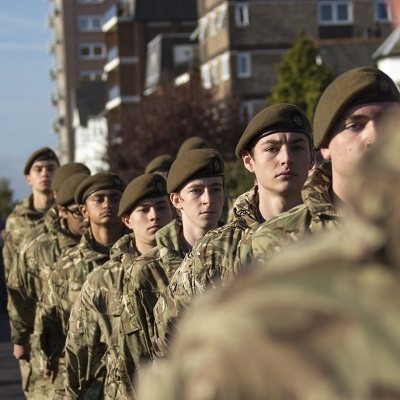 This event is the pinnacle of our annual calendar, and is a military tradition which will provide us the opportunity to recognise the efforts of our CCF cadets and others who have assisted and contributed to making this year a success. Our Guest of Honour for the Dinner will be Colonel (Retd.) Murdo Urquhart, Chief Executive of the Combined Cadet Force Association, and will be joined by a number of other important guests and CCF Alumni. Catering is being provided by Fuud, a private catering company, and will take the form of a three-course meal. The cost is £35 per head, with a cash bar selling alcoholic and soft drinks available between courses. Service personnel are invited to wear Mess Dress and medals may be worn. For others, the priority of dress is as follows: dinner jacket (Black Tie) for men, or lounge suit if Black Tie is unavailable, and equivalent for ladies. Cadets are invited to wear the same orders of dress, but a clean, neat school uniform is acceptable in the absence of an alternative, with the exception of cadets in Year 13 who are expected to wear Black Tie.